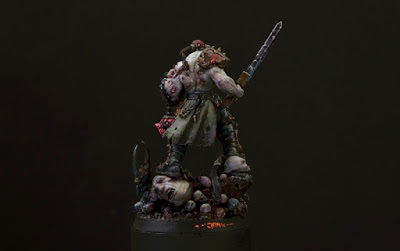 Wow, this guy is one brutal looking model. Where should I start on this. 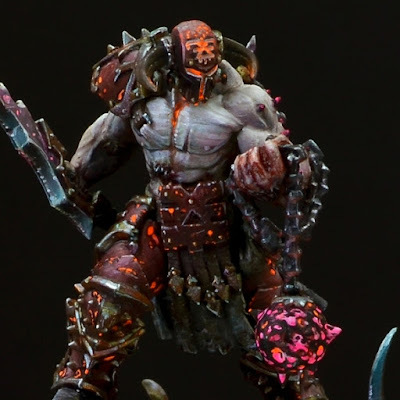 The atmosphere and feeling of this model just perfectly nails the Chaos and Khorne aesthetic. This absolutely looks like something from someone's nightmares, or at the very least a death metal album cover. I love the super pallid skin tones which have a bruised quality to them. It contrasts perfectly with the dark red of the armor. I'm not 100% sure what's going on with the neon pink and orange, but I like it. It almost makes him look like he's a video game character or something. It's just so unique I applaud the painter for doing something so bold. 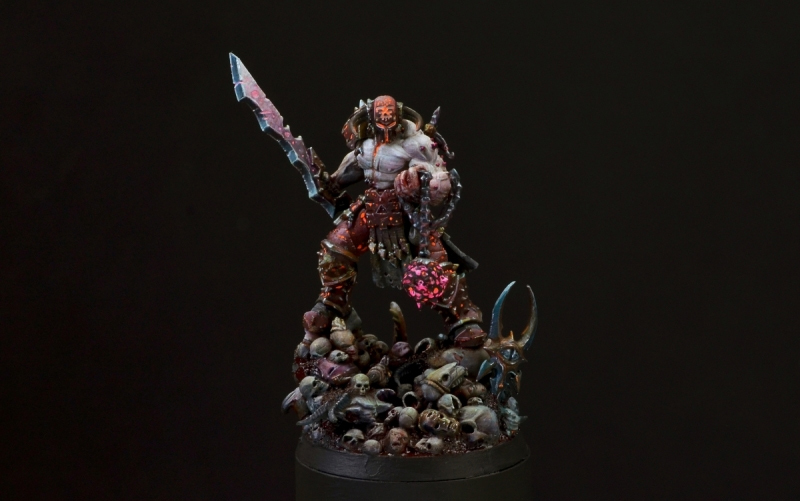 The base on this guy is great as well. He's standing on not just a pile of skulls, but severed heads as well, including a gargant's. The base perfectly fits the feel of the model and works perfectly to frame it while also giving it a mini diorama feel. Besides the neon colors, the model has a very desaturated and realistic feel to it, which probably helps the neon stand out more. All of the painting is smooth, crisp, and purposeful. Each splatter looks very purposely placed while completely natural at the same time. I would love to see more Bloodbound painted in this manner.